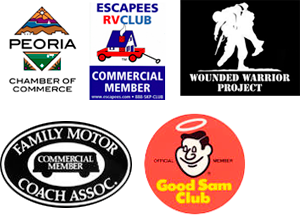 Fix My RV AZ Will Bring the Repairs to You! When traveling, your RV becomes your home away from home. It’s where you spend most of your time relaxing, sleeping, eating, and showering. We know that having even one appliance on the fritz can throw your carefully planned vacation out the window, so if you notice something strange with the performance of any of the systems operating inside your RV, be sure to contact the Glendale RV repair professionals at FixMyRVAZ. Your investment in your RV is something we know that you take very seriously, so when it comes to Gendale RV repair, the master technicians at FixMyRVAZ will treat your RV as an investment of our own. We make it all about YOU- your needs, your comfort, and minimally disrupting your family during the repair process. From the beginning to the end of your Glendale RV repair, we focus on the specific details of your appliance issues. We prefer to spend ample time with you going through these details before, during and after our work has been completed. We will carefully discuss what you can expect during the repair process and if there is anything that can be done to prevent a similar failure in the future. Fix My RV is owned and operated by Jeff Averyt, a certified Master RV Technician that prefers to do things RIGHT instead of RIGHT NOW. From tiny tent trailers to larger Class A buses, at Fix My RV we take our time to thoroughly troubleshoot your issues and complete your repairs properly with only the parts you need. If it’s broke, we fix it! We are also always happy to provide assistance for any do-it-yourself-ers out there, either by phone or in person. For more information on the services we can provide, or to schedule an appointment for Glendale RV repair, contact FixMyRVAZ today!